The workshops are emphatically noncompetitive and appropriate to all levels of training and ability. 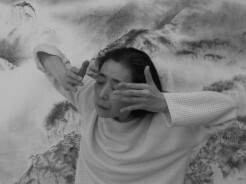 Eiko & Koma hope each participant will develop lifelong pleasure in dancing any time, anywhere available to them, whether professionally or in their living room. The exercises employ images, body articulation, floor work, and largely slow movement. However, the aim of the workshop is not to teach these. Rather, the participants, through their personal digestion of the material and of the improvisation and nonchalant partnership, which supports it. are encouraged to acquire personal taste and flexible discipline to suit their own moving body. For many participants, seeing movement intimately and being seen moving are a transformative experience, which brings a new appreciation of how "time is not even and space is not empty."